Embassy� Solid Genuine Cowhide Leather Purse. 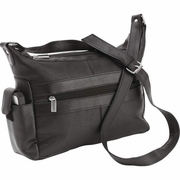 This shoulder strap purse features multiple exterior zippered pockets and exterior phone compartment; two zippered main compartments with interior zippered pocket and pouches; fabric lining; adjustable shoulder strap; and chrome hardware. Measures 10-3/4" x 9" x 3-3/4".